Here are three stocks that have insane valuations, either seemingly too high or too low. MannKind's inhaler. Image source: MannKind. Crazy valuations can go both ways. Sometimes, stocks look incredibly cheap or expensive, which can prove to be opportunities to jump in or get out. The real question is always whether the market is right, or if shares are being mispriced because of market inefficiencies. Here are three stocks that have insane valuations. Sean Williams: Let me preface this by saying that biotech companies are hard to value sometimes due to emotions and theoretical peak annual sales coming into play. However, if you ask me, MannKind's (NASDAQ:56400P706) valuation of more than $565 million (as of its May 9 close) is insane! MannKind's only approved drug is Afrezza, an inhalable, fast-acting insulin that looked as if it was going to be successful on paper, but has flopped miserably since hitting pharmacy shelves. Sanofi (NYSE: SNY) had previously licensed Afrezza, parting with $325 million in upfront fees and collaborative expenses only to walk away from its licensing deal in January 2016 on account of Afrezza not being an economically viable product. With or without Sanofi, the MannKind ship appears to be sinking. With no other drugs in its pipeline, MannKind is burning through its remaining cash on hand quickly. Having just reported its first-quarter results, MannKind announced that its cash and cash equivalents are down to $27.7 million. This represents a decline of $31.4 million from the sequential fourth quarter. Furthermore, its loss-sharing agreement for Afrezza with Sanofi jumped $5.5 million in Q1, and now stands at $68.8 million, with $2.8 million in accrued interest. MannKind's only remaining financing options are a $30.1 million line of credit from the Mann Group, and yet another $50 million at-the-market facility that could allow the company to dilute its shareholders by issuing stock. It even dual-listed its stock in Tel Aviv in October and only raised enough money to sustain its cash burn for one quarter! Meanwhile, Afrezza has yet to crack a few million dollars in worldwide sales in any quarter -- yet MannKind's reduced operating expenses still totaled $20 million in Q1 2016. There simply isn't a viable solution that I can see to get MannKind to profitability before it runs out of financing options. This is one grossly overvalued company, in my opinion. Matt DiLallo: Let me start by saying that it is really hard to value an oil and gas company when commodity prices are stable. As such, it downright impossible to value one when prices are as volatile as they've been over the past few years. That said, at nearly 20 times cash flow from operations, Pioneer Natural Resources' (NYSE:PXD) valuation is a bit rich, especially when that cash flow is already being heavily supported by hedging gains. 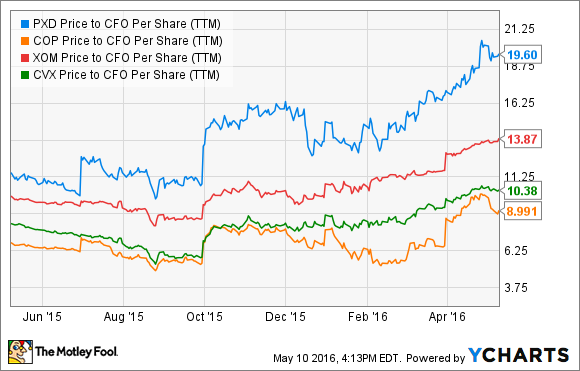 PXD Price to CFO Per Share (TTM) data by YCharts. While there is some justification that it should sell at a premium given its strong balance sheet and double-digit annual production growth, it's crazy to think this company is that much stronger than the big oil trio to justify paying twice the cash flow multiple in light of the current turmoil in the oil market. Especially when Pioneer Natural Resources' cash flow is currently being propped up by its strong oil and gas hedges, while its larger rivals don't hedge at all. In fact, last quarter the company's hedges added $175 million to its operating cash flow, which only totaled $111 million during the quarter, meaning that hedge gains accounted for more than the entirety of its operating cash flow. Furthermore, it is worth noting that while Pioneer Natural Resources has 85% of its oil production hedged this year, only 50% is hedged next year, which leaves its cash flow all the more exposed to oil if prices remain lower for longer. Bottom line: Investors are paying an awfully high price for the fast-growing Pioneer Natural Resources right now. While that bet could pay off if oil prices continue to improve, enabling Pioneer to continue its torrid growth pace, there's no guarantee that will happen. Evan Niu, CFA: Most of the time, lofty valuations indicate heightened growth expectations for a company's future prospects. Either that, or earnings have taken a recent hit that is inflating the valuation metrics. In any event, for a company to live up to its premium valuation, it needs to exhibit either a strong business in terms of differentiation, pricing power, or other competitive advantages. Angie's List (NASDAQ:ANGI) is none of the above. Trading at a blistering 310 times earnings, you might think that Angie's List was a high-growth tech name, but it's not. The company offers a marketplace of local services, connecting consumers with local businesses while providing reviews and background checks, among other things. In exchange, Angie's List charges a membership fee of a few dollars per month, with various volume discounts for long-term memberships. But 80% of sales come from service providers, which pay for advertising and e-commerce activities. As of last count, the company had 3.3 million paid memberships. But despite the fact that Angie's List has operated for over two decades, the company still struggles to turn out a profit, which is partially why the company's earnings multiple looks so inflated. Last quarter, Angie's List put up no year-over-year revenue growth, but rising costs made the company swing to a $4 million net loss. It's also not as if Angie's List is in growth mode; 2017 revenue is expected to grow a modest 6% over 2016 levels. This services marketplace is definitely not worth the crazy valuation.